It’s generally accepted that the latest operating system is the greatest operating system, especially in the eyes of the average consumer. A fresh new look seems to temporarily put to bed any gripes we had with its predecessor, having grown weary of it over the last year or so. A fresh new look is exactly what we have with iOS 7, as well as a few other key features, but is this the greatest version of iOS to date? 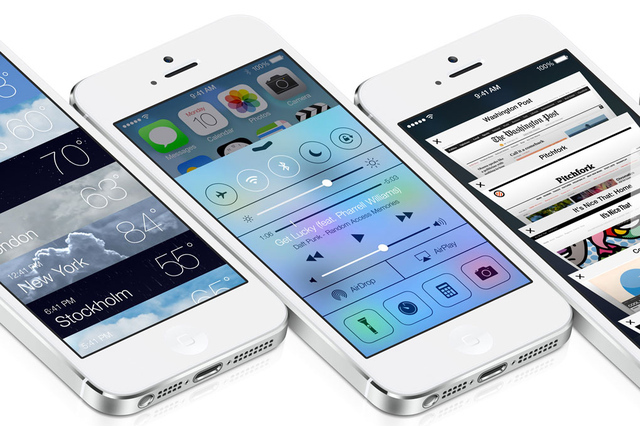 What features make it worth the upgrade from iOS 6? Let’s have a look at what it has to offer. The first immediately obvious change is the UI. Lead designer Jony Ive placed primary focus on removing the infamous skeuomorphic elements with which previous versions became synonymous, such as the faux leather look of the calendar most notoriously. 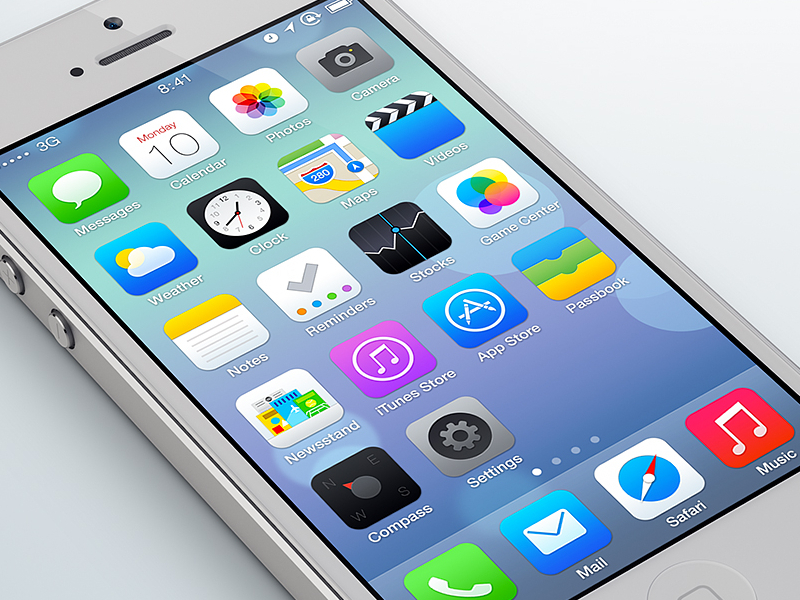 iOS 7 brings in a new ‘flat design’, similar to that of Windows Phone, though in keeping with the familiar layout of the iOS home screen. The general user interface is much the same, there are no drastic changes to layout of apps or navigation of the OS, but everything looks a lot cleaner. Generally, aesthetics are a matter of preference, but for the first time since the iPhone’s inception iOS has been given a meaningful, and much needed, UI overhaul. One of the key feature additions this time around is the Control Center, a neat drawer that you can swipe up from the bottom of the display at any point, in which you can find toggle controls for connectivity options such as WiFi, Bluetooth etc; it is useful for saving battery and supplies a number of features that many have found useful for years on Android smartphones. 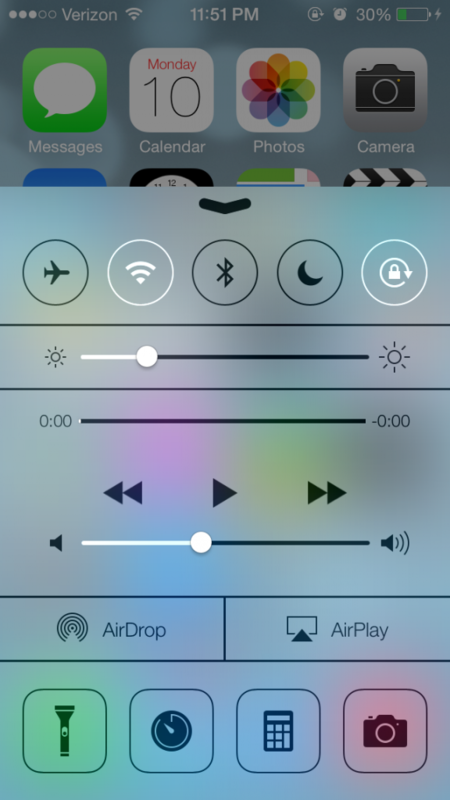 You can also change brightness, access the camera from here amongst a few other things. It’s a far more productive way of accessing the key settings that are most demanded by iOS users, a great addition, though as I said, something that has existed on Android for a long time. One of my personal favourite introductions to the OS is AirDrop, which gives developers the ability to integrate Apple’s wireless sharing platform into their apps for quick exchanges of data with other iDevices. It’ll be interesting to see more examples of this in use over the coming months as developers push updates for iOS 7. Developers and users alike also look to gain from the new Background Refresh feature of the OS, which keeps apps running, with your permission, in the background so content can be refreshed for immediate viewing when you open the app, rather than having to wait a few seconds for latest content on the likes of Facebook, Twitter and news apps. Apple claims this won’t harm your battery life, which will be a huge bonus. For the media consumers among us, there’s a boost to music and photo services, with photo filters similar to those found on Instagram and the like, for quick and easy editing of photos. Apple have also introduced iTunes Radio; with over 200 ad-supported radio channels, you can now stream music via iTunes straight to your mobile for free. Some other gentle tweaks that will benefit users who upgrade are the unified search and browser bar in Safari, audio-only FaceTime calls and improvements to Siri and new multi-touch gestures. 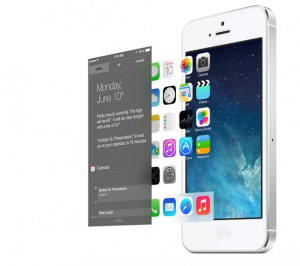 Is iOS 7 worth the upgrade? Whilst the new UI is a refreshing change, it won’t be to everyone’s tastes. I’ve briefly covered here a few of the great features that you should certainly enjoy if you upgrade to iOS 7, however there are some reasons to hold off too. For instance, many developers haven’t yet updated their apps to fit in with the new design which disrupts the new experience, and users will undoubtedly be reporting quite frequent bugs and crashes for a little while longer, as with any new OS. The new look is very garish and may not be for everyone, though I’m still on the fence as to whether I think it’s an aesthetic improvement. Some elements certainly are, but others need tweaking, such as the folder icons in my view. Personally I believe that it’s well worth the upgrade, and it’s a very strong improvement and bold refresh of an ageing UI. It’ll take some getting used to, but you will get to grips with it quickly, bugs will be gradually ironed out, and apps will be updated in time. New features have aided greatly in productivity on both iPhone and iPad in the past, and this is no exception; Apple has set out to provide developers with ways of making their apps even more efficient and productive. Over the next few months we’ll hopefully see developers embrace it and see the OS go from strength to strength.